Midway Island(s), or Midway Atoll is a small 2.4-square-mile (6.2 km2) atoll in the North Pacific Ocean. The atoll is about one-third of the way between Honolulu, Hawaii, and 2,200 nautical miles (4,100 km; 2,500 mi) east of Tokyo, Japan. This position about 1/2 way from North America to Asia, giving the island its name. Midway is near the northwestern end of the Hawaiian archipelago of islands but is not part of the Hawaiian State. Midway is less than 140 nautical miles (259 km; 161 mi) east of the International Date Line and observes UTC-11 (same as Samoa), eleven hours behind Coordinated Universal Time and one hour behind the state of Hawaii. It is therefore almost exactly the opposite side of the world from Greenwich England which is also a reason for the name Midway. What Does Midway Look Like? 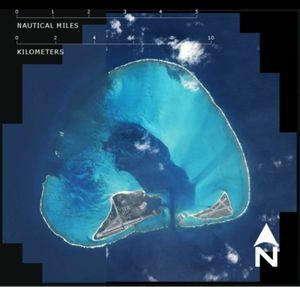 The Midway Islands consist of two larger sand islands Sand Island and Eastern Island plus a ring-shaped barrier reef and several smaller sand islets. The highest point on the islands is only Millions of seabirds call the islands home. What is the Legal Status of Midway? The islands are not part of the State of Hawaii but rather it is an unorganized, unincorporated territory of the United States. Unorganized means that there is no local government. Unincorporated means the island is a US territory or possession but not a part of The United States of America itself. Since there is no indigenous population, the population is completely temporary the lack of local a representative local government is not a problem. Midway is designated an insular area under the authority of the U.S. Department of the Interior. It sits within The Midway Atoll National Wildlife Refuge, encompassing 590,991.50 acres (239,165.77 ha) of land and water placing nearly everything that occurs on the atoll directly under the control of the US Fish and Wildlife Service. The refuge and most of its surrounding area are part of the larger PapahÄnaumokuÄkea Marine National Monument, giving the National Parks Service juristiction as well. For statistical purposes, Midway is grouped as one of the United States Minor Outlying Islands. There is no crime on Midway. If you break the rules expect to be in the next available seat off the island. If there was a serious crime and the locals were afraid the criminal was going to leave (how exactly, is unclear) the old Navy brig is available as a lock up. 1. Become a US Fish & Wildlife volunteer or staff member. Generally 6 FWS personal and 10 to 12 volunteers are stationed on Midway at a time for 3 to 4 month stints. They and the contractors keep the island running (each covering multiple jobs) from guiding visitors to opening the local bar and cooking. 2. A Native American owned corporation based in Anchorage, Alaska called Chugach Alaska Corporation provides contracted services on Midway for the FWS. The contractor reportedly employs about 55 persons but most of the contractor employees are foreign workers from Thailand, but some are US citizens. As this article was written they were looking for a US citizen Project Manager to run Midway. If you like remote postings check out other jobs they offer on remote island military bases around the world. 3. 4 airport/fireman contract workers and one Physicans Assistant/PA (the sole medical presence on the Midway Islands) round out the resident population. These positions are all periodically advertised online. It is usually possible to visit Midway with enough money and persistance. It does require substantial planning however because organizations or individuals wishing to visit Midway Atoll must apply for a permit from the Papahanaumokuakea Marine National Monument months in advance of their intended visit. Midway's remote location makes it expensive to reach. Most trips start from Hawaii though. The economy is derived solely from governmental sources and tourist fees with all food and manufactured goods being imported on the same plane you are coming in on, so since you and a handful of other visitors each year are supporting the whole place, expect to pay accordingly. Midway was the focus point of the Battle of Midway, one of the most important naval battles of the Pacific Campaign in World War II, fought on June 4–6, 1942. Nearby the islands, the United States Navy defeated a Japanese attack against the Midway Islands, marking a turning point in the war in the Pacific Theater. This interesting military history is the focus of annual history tours by Military Historical Tours to Midway. Visitors are flown in from Hawaii by a private air charter company based in Honolulu which provides air service to the Midway Islands on their 19-seat Gulfstream with a capacity of 3200-lbs. The focus of the FWS program, a select few visitors get to view the over 2 million seabirds, swim in the lagoon and view the marine and animal life around Midway. The current provider - The Oceanic Society - offers naturalist led ecotours consisting of groups limited to 16 participants. Occasionally a cruise ship well off normal cruising routes will call on Midway. Access is by tender boats. Strict regulations requiring that boats and ships be cleaned before they enter the wildlife refuge make the cruise ship option only valid for the more adventuresome and expensive of cruises. Don't expect Disney's Mickey Mouse boats to come calling. Sailors must apply for permits to visit months in advance of traveling to Midway and the Monument around it. The very strict guidelines that must be followed in order to transit through these protected waters include that vessels must have their hull cleaned prior to entrance and owners must pay $1500 for the required monitoring devices that track vessel movements while in monument waters. These rules are in place to try to inhibit the introduction of invasive species and make sure that the fragile coral reefs are not jeopardized by errant sailors. You can read more about the history of Midway Atoll in the companion article. I would like to visit Midway someday. Hopefully not due to an emergency in flight, however. I spotted the video on the emergency 747 landing and thought - darn if I was just on that plan I could have ticked off Midway without buying an plan ticket there!